“Education is the only solution. 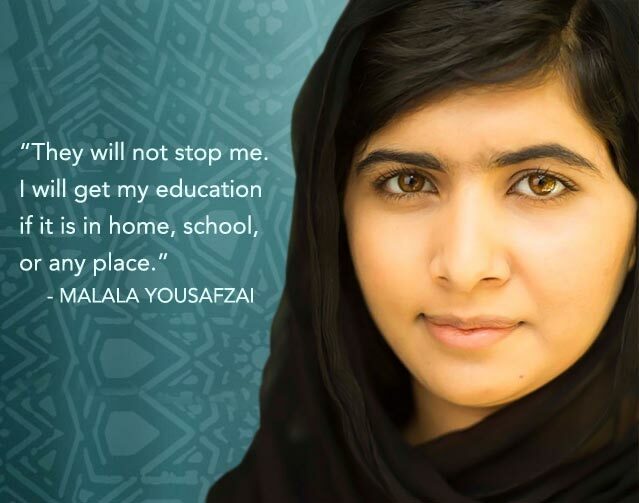 Education first.” The words of 16 year old Pakistani school girl Malala Yousafzai. Campaigning for girls’ rights to education in a country where overall literacy rates are below 50% and those of girls maybe half or even a third of that , at 15 years old Malala Yousafzai was shot in the head by the Taliban last October for her actions. Last Friday she addressed the UN with a call for access to an education for all children around the world. Approximately 57 million children worldwide do not have the opportunity to learn. I can’t imagine a reality where learning is either not available or inaccessible. Typing this article now for instance. I would be unable to do this if I had not received an education. I wouldn’t be able to read or write. I would be ignorant and vulnerable. A dangerous place to be. Malala’s closing words to her speech, “One child. One teacher. One book and one pen can change the world. Education is the only solution. Education first.”, concisely hit home the simplicity of what is needed. With education available on a global level many of the problems faced by humanity individuals could significantly reduced. For example a child who can read and write and has access to information is better able to take care of themselves and in the future a family. I have seen this first hand in Katiet where, for example, basic medical knowledge we take for granted having learnt as children is unknown and as a result unnecessary suffering occurs. This can also be related to environmental situations. Malala’s words resonant very clearly with what A Liquid Future is trying to achieve in the Mentawais by providing access to knowledge and information and sharing it for the benefit of all. Being able to read and write and have access to the opportunity to learn in today’s world is a necessity, not a luxury, that should be available to everyone allowing each individual the chance to best express and take care of themself, others, and the planet. Congratulations to Malala, an exceptional girl. For more on Malala’s visit to the UN and her campaign please click on the following link, http://www.bbc.co.uk/news/world-asia-23282662 or for her speech in full http://www.bbc.co.uk/news/world-asia-23291897.